Disclosure: This post contains affiliate links. This means I may earn a small commission if you purchase through one of these links. This does not affect the purchase price for you. Remember: if your dog doesn’t like to wear clothes, don’t force it — and always supervise. KNIT ONE: I knitted a variation on this pattern for the sweater shown in the above photo. Yarn cost me all of $3, and it took me only a couple of days to finish. We also have a post the includes Seven Free Dog Sweater Patterns if you would like additional inspiration. To start, decide the approximate location of your “garland strands.” This may change later, but it will at least give you a guide for cutting appropriate lengths. 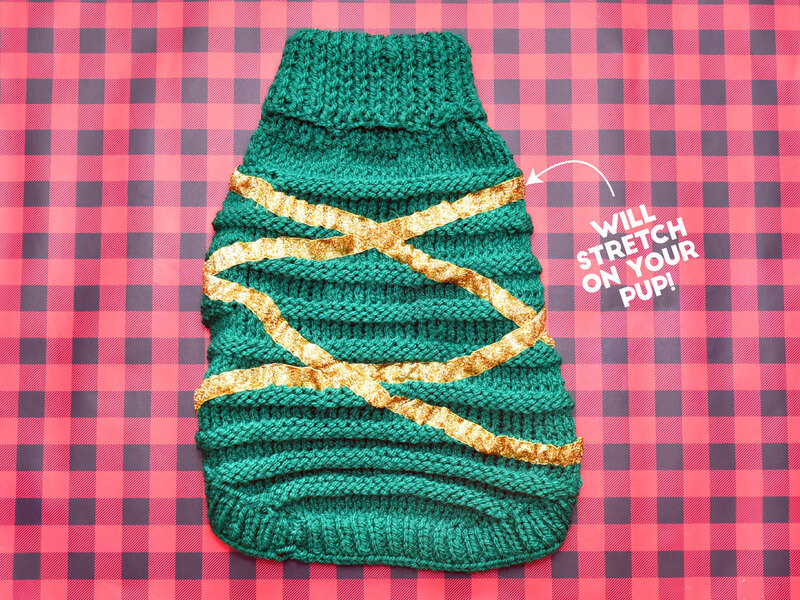 This step is a little tricky — unless your ribbon or rickrack is stretchy, you will want to account for the amount that the sweater will stretch once it’s on your dog. Think of those old-school scrunchies: when they’re relaxed, they’re bunchy. When you stretch them, the bunching disappears. Your ribbon should be slightly bunched until the sweater is on your pup — if it isn’t, it won’t have any more stretch in it and the sweater will be too tight! Make small, frequent stitches if possible to keep the garland looking neat. If it isn’t neat, don’t sweat it. Sharp eyes may notice that my sweater has sprouted an additional garland in the above photo. Keeping the ribbon bunched, stitched, and in the intended location turned out to be a bit harder than I anticipated. I needed a fourth garland to account for a large swath of unclaimed real estate in the bottom half. My point is: don’t be hard on yourself if it doesn’t go perfectly. You can also add something else to fix it, and I promise that you dog won’t notice or care! I promise that this step is much easier than the last! In fact, the hard part is all over. Pick your pom-poms and lay them out on the sweater in the general layout you would like for the final sweater. Next, stitch ’em down! I stitched each pom about three or four times. Tie a secure knot, and trim your thread. Repeat with each pom. Time for the finishing touch! Stitch the star applique anywhere near the sweater’s neck. I chose the ribbed cowl neck, but do what works for you! 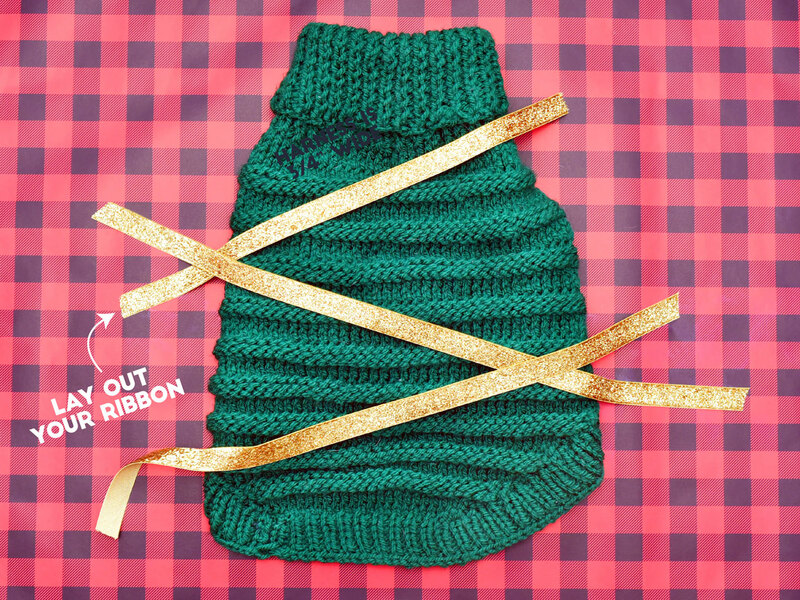 You have successfully made a DIY Christmas tree sweater for your dog! Send up photos of your finished projects — we would love to see them! This is the BEST Christmas sweater ever! Using that pom pom link next time I order! Love the size & color. 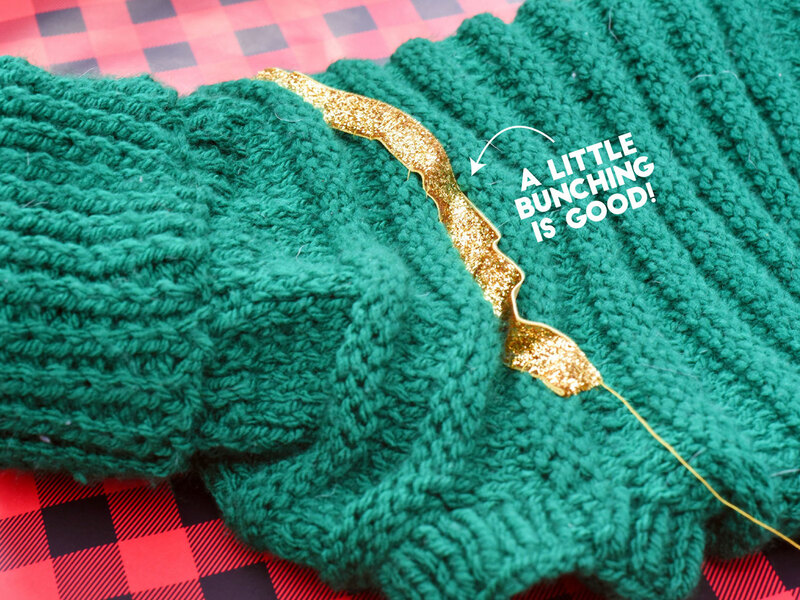 Pingback: DIY Ugly Christmas Sweaters - C.R.A.F.T.